Eritrea leading the Championship with 9 Golds, 1 Silver and 1 Bronze medals so far. Awesome. Meron Teshome, Awet Habtom and Mosana Debesay (L-R) posing for picture after winning Gold, Bronze and Silver respectively in the elite men and women ITT of the Continental Championship. 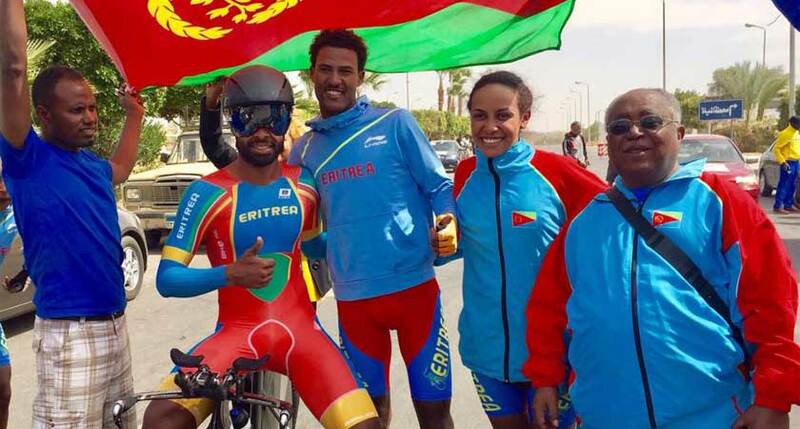 Eritrean rider Meron Teshome have won his second Gold medal yesterday in elite men Individual Time Trial (ITT) at the ongoing African Continental Championship 2017 in Luxor, Egypt clocking a time of 53:16, which is 26 seconds faster than South Africa’s Stefan De Bod who finished second. His other teammate Awet Habtom finished third, 49 seconds later to claim Bronze. Awet Habtom is also competing in the U23 category. So far he is placed second using 54:05 time while South African Stefan De Bod leading with a time of 53:42. In the elite women ITT championship, Eritrean Mossana Debesay wins Silver following Aurelie Halbwachs of Mauritius and ahead of South Africa’s Jaunita Venter. Her teammate Wehazit Kidane finished fifth. This brings the total medals scooped by our national team to 9 Gold, 1 Silver and 1 Bronze. 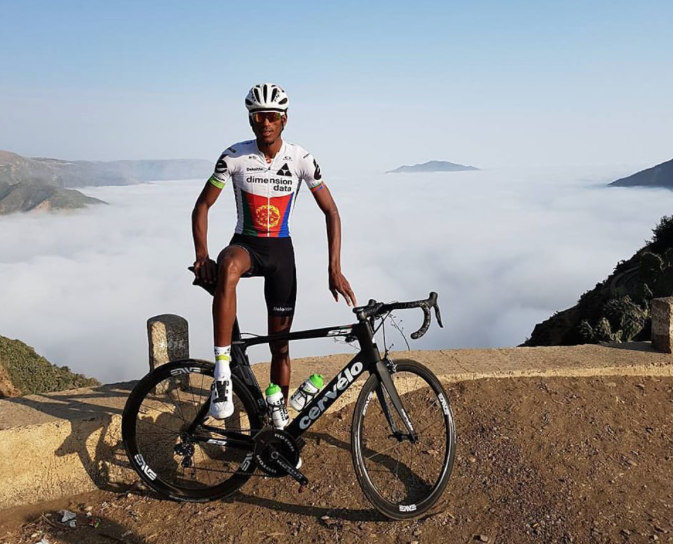 In this edition of the African Continental Championship, Eritrea was represented by Meron Abraham, Meron Teshome, Amanuel Gebregziabiher and Awet Habotm in the Men’s elite group. Wehazit Kidane, Mossana Debesay, Bisrat Ghebremeskel and Wegahta Ghebrehiwet represents the women’s elite team. እታ ፍርፍር ዝበለት ዓይኒ….ዓወት ኣርእያትና!! 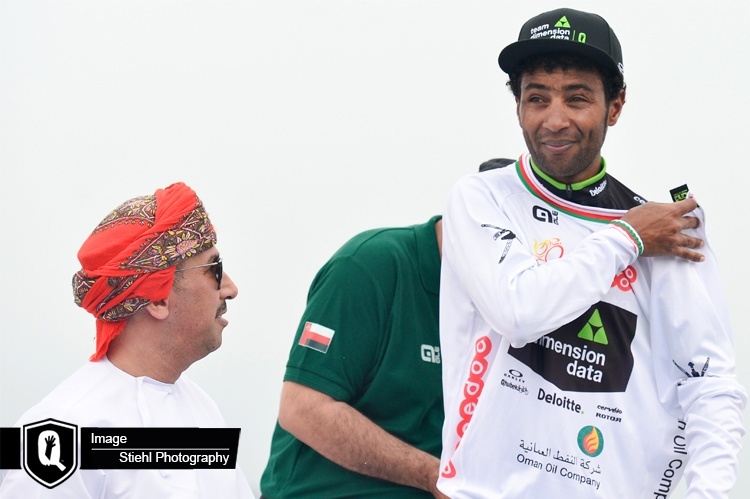 Meanwhile in the Tour of Oman, Merhawi Kudus kept his lead in the white jersey competition. Woah Eritrea, zentxebareq awetat, proud to be Eritrean. Gold in the goldmines and gold in sports. Golden- Eritrea! So why is Eritrea the best in cycling but the worst in soccer? Does government policy favor cycling more than soccer, for example, are cyclists exempt from national service whereas soccer players are not? Do cyclists get paid better? What is the reason soccer players opt to not return to Eritrea but this problem doesn’t exist in cycling? Even when some football players had failed the nation by taking the easy route our government never on football and continue to invest. It is not about National service but that i what you like to see. On the hand national service is our right too, hence either celebrate with us or leave us alone. I heard once a famous national soccer player say that there’s a “very bad culture in Eritrean soccer circle, mostly adopted from the colonial Ethiopia/Dergue era”. As you may know, Ethiopian soccer plays have a long history doing this sort of stuff. I too am leaving the political issue aside here. Interestingly, he was one of those never returned. Nonetheless he seemed to know the core issues plaguing Eritrean soccer. I caught my attention was his intellectual ability/honesty and set the tone for thoughtful discussion. I hope he reads these comments and provide us with his thoughts. I have no doubt knew what he was talking about and therefore I my thought is the existing soccer culture needs to be destroyed altogether and they start all over again. I once worked for a very large/great company but the business unit was so dysfunctional (culture wise) the parent company chose to ultimately break it up and get rid of it all. They tried for years to fix the issue and spent millions in the process, but they failed. The lesson is: bad organizational culture can’t be fixed. Nothing happens in a vacuum, there has to be a context. Therefore discussing issues concerning a particular nation can not be apolitical. The omission of inconvenience facts such the pool factors to advance an absurd narrative can only be described as political prostitution. You hammered on the head! Funny how some want to change the narrative instead of celebrating the current cycling talks about football. They always do it. I was in Eritrea the summer gone and have see the excellent grass root activities they are working on. Football is a team sport and getting a result takes longer and it does need to be cooked longer. Yes we need to evaluate and re-organise, but those on the on side can do that. The talent is there result will be coming soon. Funny how sam said forget politics. That is including politics when you want and try to gorget it other times. The football, cycling and politics is ours. Our football will shine soon. I agree with you that there is a lot work done to motivate and engage kids in all areas, especially in higher education and fields of sport. Yes, I was there not long ago too and seen it all. That said, I do think the colonial cultural question of futbol is a valid question. While I celebrate successes of cycling team and the topic of futbol comes in quite easily in my mind. Why not? It is only natural – most popular sport and accessible in our country. Shouldnt we all look for opportunities to expand similar success the futbol arena too?? Moreover, why question people’s motivation towards end??? The answer my friend is that cycling during the Italian colonization in the late 1920 thru the 1930 it was big among the Italians(soccer was in its infancy) ,and the apartheid system allowed only Italian participants, but the sport took off and became a passion among the Eritreans,and soon produced great cyclists the ones I remember growing up were Gigante, Giovanni Mazzola, Berbere ..etc. and soccer was an after thought.When the Ethiopians came in the late 1960’s the sport suffered sponsorship shortage, by then soccer was well established and totally dominated in fandom. At one time they had a cycling event in Addis Abeba the race was completely dominated by the Eritreans, and that was politically unsavory to the Haile Selassie Regime and was more or less squashed as a sport in Ethiopia,by then the exodus of Eritreans to Addis for a better life took its toll not only on skilled workers but also athletes as well. Eritrean excellence in sports is not an accident but the result of an all inclusive, wholesome policies of the government that prioritizes development based on self reliance. Congrats to our beloved athletes! Excellent observation and credit to Eritrean government. 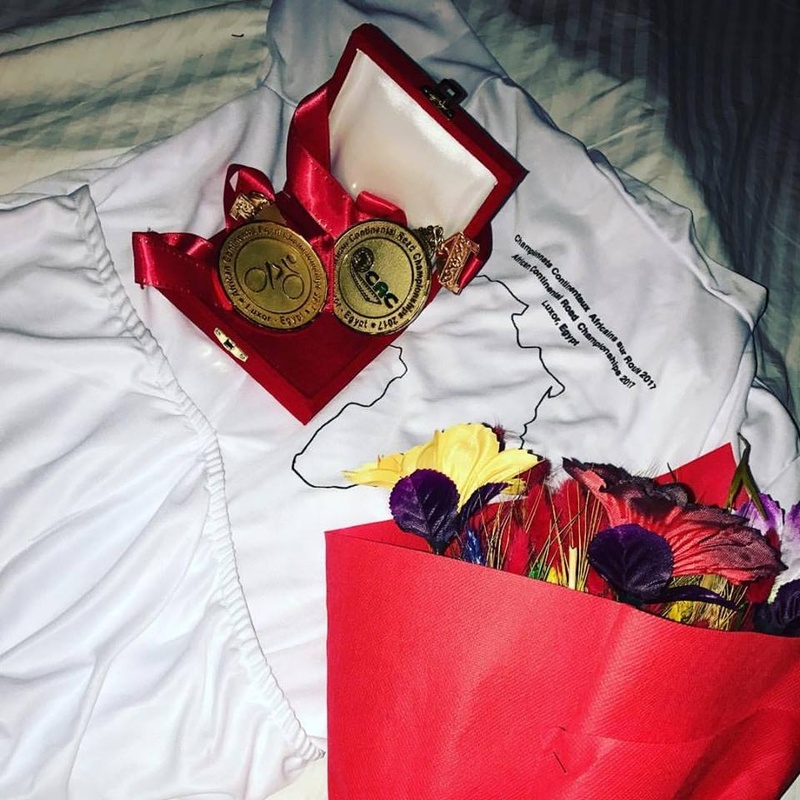 Who won in the woman category ? I think you omitted it deliberately. Please, politics and sport are two different things . weyane di not winn. For the record we always ready to celebrate Ethiopian victory too they did well on the women team trial. Tesfa had included the result above. Asmerom, you could see the picture of the 3 ladies on the podium to know there was only one black girl (Eritrean) which means no Ethiopian. ==> “AdiA Ghedifa’s Hat’NaA” !!! I love ❤️ you too, brother. The ALL-Tigrayan-riders of Team Ethiopia so far failed to make it to the podium. No politics here. The top 10 winners result shows your Tigraweyti rider crossed the finish line 9th. I don,t know at this time but it was Tv-ERI – antics before . Were you in town lately, you must have missed it terribly. Your chosen Tigray compatriots did not make it they were not one of the best three. What are you complaining in this grand Eritrean forum. Shall we warmly recommend you the antiquated MLLT colloquium TOL and Aiga where you fell comfortable. I don’t think anyone has asked you this before. Have you done your national service? What do you mean by intentionally omitting, it seems far fetched. I think you are indulging in conspiracy theories here. Did you miss the results in the beginning you might be focusing on some thing else. The result is right on the top news in this vert article. No politics here pure sport. Meron is a stud. He is tall and strong. He was one of the two cyclists that was denied further training in Switzerland. I’m sure it has hurt his career because if he had gotten that opportunity, he would have been racing at the Tour de France by now. He’s got all the tools. Expect big things from this young man. Congratulations and Bravo. 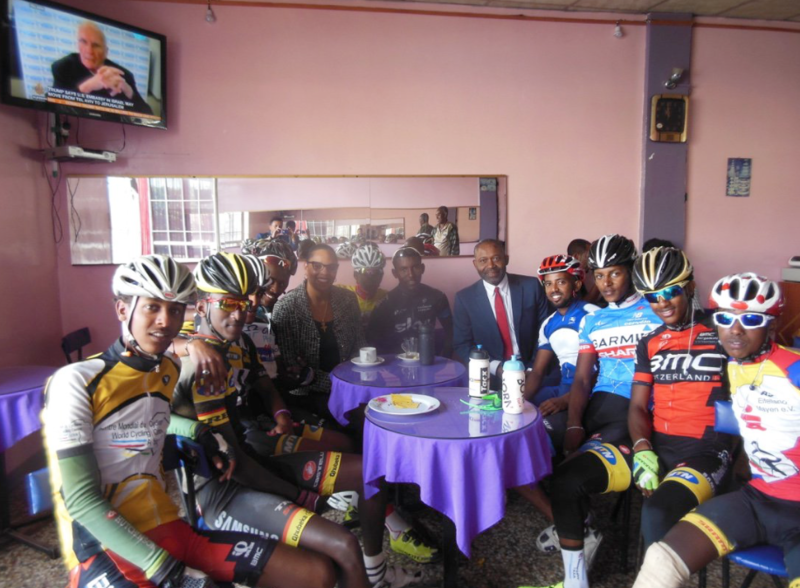 Eritrea is known for its cycling prowess. Ran into some amateurs who had just completed an easy route — only 60km! Here are the “Tigers” of Eritrea taking the people and country to fame and glory. Then again what could you expect from the Eritrean! Hayelom Kibrom fm Tigria are from the end the last and his name is “Hayelom”means “he could win”and his last name is”Kibrom”means “if he win ,we will be proud of him”but when he compete with Eritrean”Teshome”means “he is Always coming first” he could not even get closer to Meron,Meron keft hayelom dorever and hayelom will never compete with Eritrea again.It’s just so!